This review was written by Myles, a 27 year old TLC Endurance multisport athlete. The Air Relax Recovery boots are the cheaper competitor to the Normetec recovery boots – about $400. I’m going to blast out a few thoughts I have about this. Feel free to share these thoughts with your other athletes if they are interested in buying some. The thing has four pressure settings, but you have to set it to the third for it to start feeling like it is doing something. The squeeze from the boots caused a little flare up in my foot with my morton’s neuroma. The easy fix here was using some PVC pipe to protect my left foot from the squeeze. 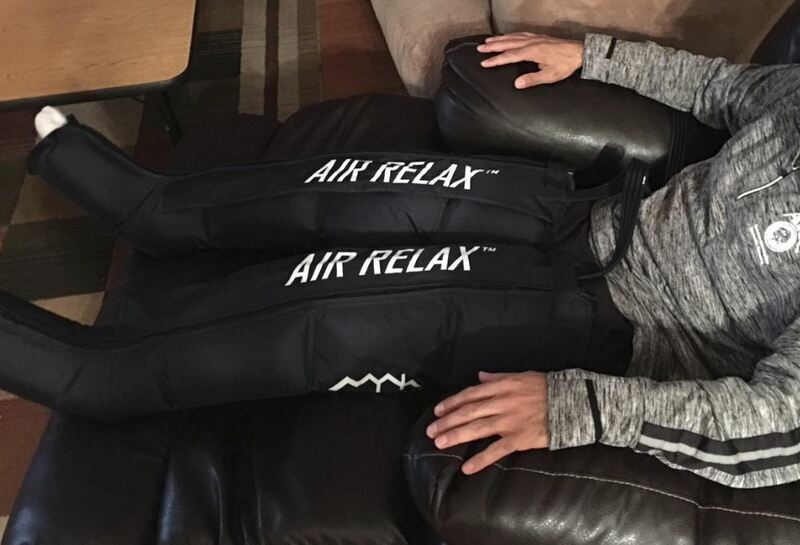 The Air Relax Recovery Boots feel good. It is a neat habit to be able to go on a hard workout, raise your legs on a reclining chair, and let a machine massage your muscles by squeezing them into recovery. Assuming all things are equal, if I had to choose between using a foam roller or using these recovery boots, sitting down is a lot more fun after a workout than rolling out your legs on the floor. However, after I get my legs squeezed, they don’t feel any worse or better than before I start the session. I would compare these recovery boots to getting a back massage from those electric massage chairs instead of seeing an actual sport massage therapist. It is a possibility that my body is so young that I naturally recover better than older athletes, so I am not seeing any benefits. I think triathletes are so type-A personality that there has to be a tool or device for everything. I think it is hard for competitive people to realize that the cheaper/easier option is the same (doing nothing) than the more expensive option (air relax or normetec recovery boots). This has got me thinking about what is recovery? What is physiologically happening when I am resting my body that allows me to run faster the next day compared to running again after a workout? I don’t think that squeezing blood out of my legs is the answer. Fun experiment. I’m glad I bought them to settle my curiosity but I’m selling them. The fact that a foam roller kind of hurts and these air bags feel good makes me wonder if they are accomplishing much. It takes a bit of force to squeeze the quadriceps and I’m not convinced recovery boots can do much in this regard.